Pound exchange rates have fallen from this weeks highs of 1.1750 falling today as lows as 1.1550 as MP’s voted down Prime Minister Theresa May’s Brexit vote for the third time. On the day the UK was officially due to leave the European Union this was another significant loss for the PM. 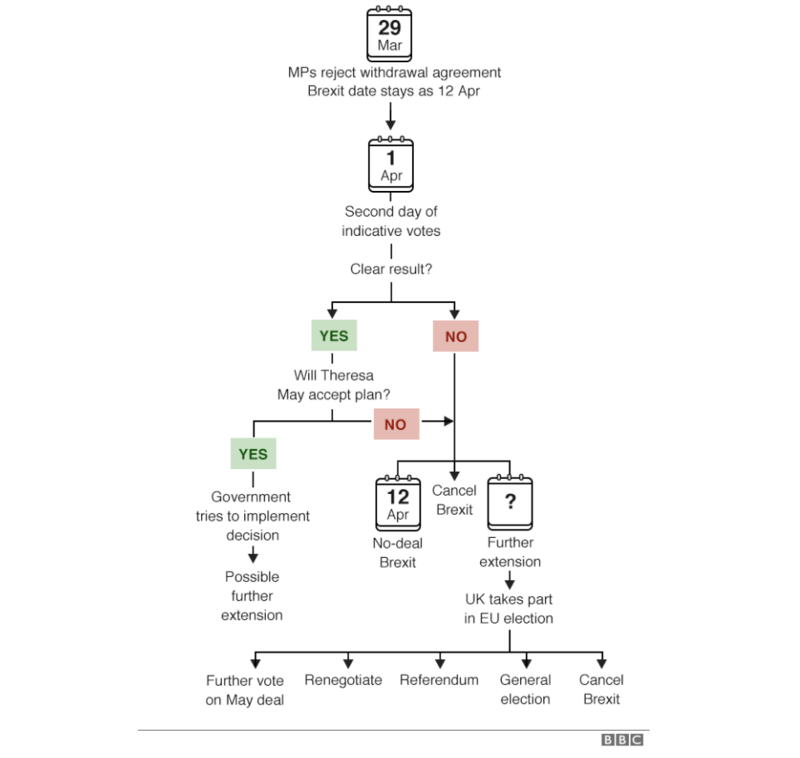 Courtesy of the BBC below you can see a detailed flow chart of the next steps. As you can see there is a real chance of a ‘no deal’ Brexit come the 12th April, however my gut feeling is a further extension will be requested and we may well be heading towards some further significant political turmoil and volatility in the form of a general election, further uncertainty for the pound. We will update details regarding Mondays votes next week. If you are looking for the best exchange rates, the first step is getting in touch with an expert broker to discuss your options. We can discuss your requirements, the market, and your attitude to risk, to help you make an informed decision on when to fix a rate. We can also provide you with a free quote so you can see how much money you could save by taking advantage of our services.